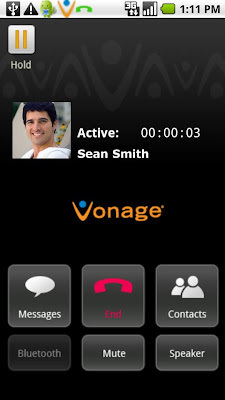 Vonage Mobile App for Facebook (Android) ~ Android Forever! "The downloadable application is free to get and free to use. The new service enhances the ability to connect with Facebook friends through the addition of voice calling. It is available for iPhone, iPod touch and Android devices. And the service works over Wi-Fi and 3G /4G networks in most countries. The new service is easy to use. The app works with a user’s existing community of Facebook friends, so there’s no need to remember screen names or to input numbers. The application eliminates dialing – users can just click on a friend and start talking. When placing a call, the friend’s profile picture and status update display on the screen."